Along with our partner, Hoyts Corporation, we recently completed the installation of a state-of-the-art digital cinema at the Royal Children’s Hospital Melbourne. The facilty will allow the young patients at the hospital to see first run digital movies while they recover or wait for treatment. 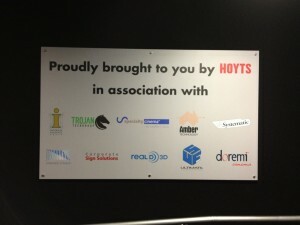 Again, many thanks for your contributions and effort on assisting Hoyts with the implementation of the theatrette in the Royal Children’s Hospital, Melbourne. By all accounts the theatrette has been performing very well and is extremely popular. The hospital have sent through some great feedback about how much the kids are enjoying the space. I thought you might like to have a look at the plaque that has been installed inside the theatrette, acknowledging the parties that have contributed both time and resource to this project.